Montessori Candy: Can You Make Your Baby Smarter, Sooner? I had an interesting conversation with a very sweet and caring kindergarten teacher last night. She was so saddened to see how many children enter her classroom without even knowing how to color! It just broke my heart to hear that. This teacher was saying that if parents would only spend a little time with their children, instead of opting to let them play video games or watch television, these children would be better equipped to begin their school years. 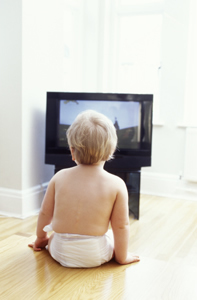 Interesting story over at NPR about video's marketed as helping to make your baby smarter. The bottom line of the story? Parents, interact with your children! :) Reading, talking, and just plain spending time with your children will benefit them socially, cognitively, emotionally, and physically. Mom and dad are way better for baby than any "educational" video out there. Great post. I couldn't agree more! So simple yet so many children missing out on one on time with their parents. Thanks for stopping by Heather!